Out of the many book events I had the joy to attend in 2015, Pan Macmillan's Women's Fiction Party was one of my favourites and so I was thrilled to attend it again this year, this time with my Novelicious hat on. Held at the Oxo Tower on the South Bank, the event was filled to the brim with authors, agents and other fabulous publishing people. One of the highlights of the event is always wandering around the room to spot the new titles the Pan Mac team will be publishing (and of course picking up the most-anticipated ones to take home, though I was really restraining myself this year as my TBR pile is topping over so I kept it to a respectful four new books) while enjoying a glass of Prosecco and some tasty canapés. The room was packed with people and so we only spotted authors such as Lucy Diamond and Rebecca Chance from a distance, but we did manage to chat to the author that had travelled the furthest to attend the event, all the way from South Carolina it was the one and only Diane Chamberlain! Now, I love Diane's books. They're all very different but each and every one I've read has made a huge emotional impact on me and so I wanted to thank her for the many tears I've shed over her words. However, never in a million years thinking I would be meeting this amazing author on the night, I was completely unprepared and I pretty much stumbled over my words saying 'I really liked your book with the yellow font on the cover'. Good going there, Zarina, really showing what an admirer you are of her work. I followed up that incoherent string of words with 'I think there were baby shoes on the cover' and Diane asked 'The Midwife's Confession?' I nodded an eager yes as I recognised the title. Spoiler alert: it wasn't the book I was thinking of and so when I mumbled how much I loved reading it and how I knew nothing of the part of history it was based on, Diane probably thought I had never even read any of her books. I have though and of course the moment we left it hit me: I was thinking of Necessary Lies, which covers the heartbreaking Eugenics Sterilization Program (and it does have a yellow font on the cover!). Sorry, Diane, I really do love your books and thanks for being so lovely and chatting to us even though you were probably thinking I was a bit odd. Besides my title mix-up, she also spoke to us about the inspiration of her new novel, Pretending to Dance (from which I bagged a hardback copy at the Pan Mac event) and the astonishing amount of readers she would be meeting in the few days she was in the UK for. Most of all though, she and her agent were just very, very lovely and appreciative of her readers, even the peculiar one that was mumbling incoherently to her that night. Taking a break from the canapé-munching and author-spotting, publisher Jeremy Trevathan held a speech in which he said that like every year he wanted to highlight that the term 'women's fiction' doesn't do justice to the huge variety of books that we were raising a glass (or two) to that night. And he was right; from rom coms written by men to psychological thrillers written by women and everything in between was celebrated last week at the Oxo Tower. Categorisation of female authors and books primarily aimed at a female market are an ongoing discussion in the book world, perhaps next year the event will simply be called Pan Mac's Annual Fiction Party? We'll have to wait and see. Thank you very much to the Pan Mac team for organising the event, and here's to a fabulous publishing year for you all! Happy New Year! Did you make any resolutions for 2016? Finally taking the daunting step to finding an agent for your book, perhaps? Or meeting a favourite author to tell them how much their work inspired you? With this month's Dates For Your Diary we have you sorted, as it includes book launches, insightful workshops and plenty more to enjoy and start the year with a bookish bang! 6 January – Learn the secrets of getting published with Alison Baverstock, author of The Naked Author. The seminar takes place at the Southbank Centre in London and tickets are £15 each. 12 January - Station Eleven by Emily St John Mandel is one of my all-time favourite novels, so I have to sneak this one in here. Foyles Charing Cross Road in London has made it their book club pick for this month and you can attend the discussion for free simply by dropping them an email. 14 January – I Call Myself a Feminist brings together twenty-five of the brightest, funniest, bravest young women, to ask what it means to be a feminist in 2015. At this event at The Bedford in Balham, Kate & Martha Mosse will speak as mother and daughter about intergenerational feminism with Meltem Avcil, Amy Annette, Caroline Kent, Hajar Wright and others. Tickets are £6 for entry only, or £10 with a paperback copy of I Call Myself a Feminist. 14 January – Faking It Until You Make It: Whether you're submitting to literary agents or self-publishing, you'll need to spread the word about your book. Join bestselling author Clare Mackintosh (I Let You Go) at Bloomsbury Publishing in London as she presents a masterclass on building your author platform. The evening costs £35. 20 January – Join Amy Liptrot and Olivia Laing for the book launch of Outrun at Waterstones Piccadilly. Tickets for the event are £5 each, which is redeemable against purchase of either of the authors' books on the night. 21 January – Join Dulwich Books in London for the inaugural event of their new crime and thriller event series, Death in Dulwich, with authors Fiona Barton (The Widow) and Ann Morgan (Beside Myself). For £10 you get entry to the event and a mystery cocktail. 23 January – You have written a book but now comes the next difficult step: hooking an agent. How do you do this? Literary agents will be present at this half-day event with practical advice and tips to doing just that. Tickets are £149 and include lunch. 23-24 January – Write Now provides you with all the information you need to get your women's fiction book published! Taking place in Bath over the course of a weekend, it'll be attended by people from publishers and literary agencies and includes sessions on marketing and PR, using social media, rights and much more. Tickets are £300+VAT (£150+VAT for Author Club members) and include accommodation, refreshments and lunch, plus a gala dinner with a big name author. 26 January – When it comes to literary accolades, the Costa Book Prize is one of the most prestigious in the UK. Last year H is for Hawk by Helen Macdonald won the prize, and towards the end of this month it will be revealed who will scoop the award for 2016. 28 January – Join Jill Mansell for an exclusive literary evening celebrating the publication of her new novel, You and Me, Always at the Headline Publishing Group offices in central London. Tickets are £10 and include champagne, nibbles, a Q&A with Jill and a goody bag with a hardback copy of her new novel. 29 January – Have you participated in World Book Night before? Then you know what fun it is to volunteer for this annual event and give books to those who need it! If you're new to the scheme, the deadline for applications to take part in this year's event is on 29 January, so make sure you get yours in before then. And that's it for the first month of the year! Please comment below or tweet me on @zarinatweets if you'd like me to include your event in an upcoming post. I am wiggly with excited to tell you that my second novel The Vintage Guide to Love and Romance is now out in the world and available to buy! It's been such a whirlwind of excitement since I self-published Yours Truly back in 2012 and you all helped me to get it into the top 10 of the kindle charts. I'm so grateful for the support you showed me. It changed everything. It changed my whole life for the better. I've worked very hard with Pan Macmillan to make The Vintage Guide to Love and Romance the best book it can possibly be. I wanted to write you a story with a fresh, bold protagonist, a meaty plot, a touch of fairytale romance and lots and lots of laugh out loud moments. I wanted to write you a story that would make you feel happy. I hope I have achieved it and that you fall in love with Jessica Beam and Co, as I have. I am going to once more ask for your help and support in getting this book out there into the hands of readers (I'm nothing if not incredibly cheeky). If you could Tweet or Facebook about the book, that would be mega. If you do buy it (thank you, thank you thank you) and you enjoy it, please tell a friend you think will enjoy it too! I'm having a real-life launch tonight and couldn't be more excited about it. And on Monday 13th April, the lovely Ana from This Chick Reads is throwing me a virtual launch on Twitter. We will be serving all the virtual vintage champagne and virtual cake that you could ever hope to virtually enjoy. I hope you can join me in general book chat and hijinks. Above all, above everything, I hope that The Vintage Guide to Love and Romance entertains you. That's what I want to do most of all! Last year Belinda Jones ran a fantastic competition as part of her Sunlounger anthology launch. Three writers would have their short story published alongside some of the most amazing women’s fiction authors. I wanted to be part of it so badly. I wrote a story, I honed it, I was proud of it. I didn’t win, but I congratulated Holly Martin and I devoured the Sunlounger anthology, reading heart-melting and hilarious stories, all of them sun-soaked. This year, Belinda announced the launch of Sunlounger 2, another amazing anthology and another competition to be a part of it. I wrote a new story, I worked extra hard on it, I drank loads of coffee and ate about a million chocolate biscuits. I sent it off. And then I was invited, on behalf of Novelicious, to the glamorous Sunlounger launch at Trader Vic’s at The Hilton in London. I put on something colourful and summery, ran through pelting rain from the tube (thanks, weather!) and was welcomed into the exotic bar area, complete with Mai Tais and beautifully decorated cupcakes. The Unfinished Symphony of You and Me is the laugh-out-loud funny and sob-equally-loudly brand-spanking new book from fabulous women's fiction author Lucy Robinson. The novel was published yesterday, which was the perfect excuse for a celebration in central London with a bunch of fellow book geeks while enjoying a glass of wine (I say 'a', but we all know there is no such thing as a single glass of wine...). I read the novel a few weeks ago and fell head over heels in love with Lucy's witty writing and lovable main-character Sally. After finishing the book I was gushing about it all over the Internet, as you do, and Lucy was so grateful for my incoherent ramblings that she invited me to her launch party with the promise of wine. I never say 'no' to an offer of wine anyway, but having the chance to attend the launch for a book that I absolutely adored and meet its talented author in the process? Yes, please! 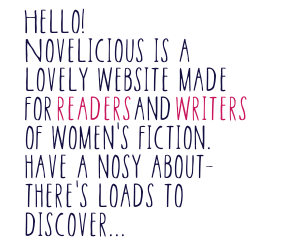 The brilliant evening was a who's who of wonderful people, with publishers and book bloggers in attendance alongside an abundance of fantastic authors, such as Victoria Fox, Hannah Beckerman, Ali Harris, Paige Toon, Matt Dunn, Rowan Coleman and our very own Novelicious funny-lady, Rosie Blake! Lucy was the star of the evening, of course, and she even sparkled like one in her stunning dress as she gave a heartfelt thank you speech. The event was held at one of the world’s most well-known, individual department stores, Fortnum and Mason’s, and it was difficult to walk past the beautiful sweet displays on my way up to the ice cream parlour on the first floor. There I met Alexandra, her editor Kate Bradley, Kim Young, publishing director, and Jaime Frost, HarperCollins publicist, along with lots of other lovely book bloggers. The choice of ice cream was incredible, and I think it took most of us a good half an hour to decide what to have. When our sundaes arrived (mine included pistachio, coffee and praline flavoured ice cream, and was delicious), we discussed all manner of things with Alexandra, and were able to overcome our disappointment that Ice Creams is the last in the series of Carrington’s books (for now) when she revealed that she’s writing a new series of books, which sounds absolutely amazing! Last week I attended the launch for Isabel Wolff's mesmerising new novel Ghostwritten, which delves into the harrowing story of a Dutch woman who lived in Java during the Japanese Empire's occupation in the 1940s. The launch was at the Free Word Centre in London and despite having worked around the corner for years and the building having a colour-popping Kermit the Frog green exterior, I never even realised it was there. As a centre for literature, literacy and free expression it was a very fitting venue for the event though and one I'll now certainly be keeping a closer eye on. I first encountered the work of Rowan Coleman through her short story Woman Walks Into a Bar, which raised money for domestic abuse charity Refuge. I then had the great pleasure of meeting Rowan at the RNA Winter Party last year and the moment we started to talk, I realised she was just as fantastic in real life as I had imagined having read her book. Then Team Novelicious made Rowan our author of the year for 2013. It's not really a great surprise then that when the invite came to attend the launch of her new book The Memory Book, I practically pushed people out the way to get myself in. And it was certainly worth the effort! After walking into the wrong room and immediately thinking 'these are not my people', I found my way down a floor to the right room and found the general cheer of the bookish world. Rowan was dressed in a gorgeous red dress, which worked well with the stylish décor of the bar in Piccadilly Circus, and greeted me with an enormous hug. I also met her fabulous team at Ebury Publishing and spotted a few familiar faces along the way. Going to a book launch is great fun when you know nobody. Heading to Rosie Blake's launch for How to Get a (Love) Life was a whole other level of incredible. Team Novelicious were out in Soho in force to celebrate Rosie's hilarious new novel and she was clearly delighted to finally have a book out there in the world to be read. After dumping my coat in a bath (seriously!) and wondering why my worst nightmare had been realised as there were toilets out in the bar space, I said hello to the lady in question and many other brilliant writers and bloggers from the Twittersphere. Today, we're really excited to be sharing an extra special treat from Novelicious Author of the Year 2013 Rowan Coleman. Here, she chats about her beautiful new novel, The Memory Book, while offering an exclusive peek at an altogether different kind of memory book of her own. Picture the scene. I am wandering the streets of Notting Hill and the birds are chirping merrily, despite the fact it is 6.00pm on a January evening and the sky is pitch black. I am imagining myself residing in practically every house I pass as I stride down Kensington Park Road en route to a very important engagement – attending my very first book launch. There would, of course, be many benefits to such an idyllic relocation, but chief amongst these – after attending Sophia Tobin’s book launch at Lutyens & Rubinstein – would be the close proximity to an enthralling independent bookshop. I could have spent hours scouring the glorious floor-to-ceiling books on display (and I fully intend to make a return trip to do just that), but it was the launch of The Silversmith’s Wife that had brought me to these swanky parts and I was conscious that my attention should be undivided for the matter at hand. So, after some initial timid lurking on the periphery (or should I say, by the books) with a glass of wine and a cheese straw, I had the opportunity to chat with lots of lovely people from Simon & Schuster and Sophia herself.